On a cold January day in Reykjavik, we found ourselves standing with a group of 30 others waiting to start the City Walk Reykjavik tour. The popularity of the Reykjavik walking tour has a lot to do with the price of anything in Reykjavik Iceland. The meeting point was Austurvöllur in front of the House of Parliament (Alþingi). January in Iceland is pretty cold with only a few hours of light at this time of the year. Mind you, you would never guess it is the house of Parliment. No guards, guns or dogs in sight which really surprised the majority of us in the group. Just a historically old looking stone building in downtown Reykjavik. We were later to learn that a previous Icelandic government was toppled by protestors throwing bananas at the building, it made for a great way to break the ice at the start of the CityWalk tour! Back to the City Walk Reykjavik. Eric was our guide on this day and a funnier more informative guy you would not meet. Some of the stories he told had us all completely in stitches. I would love to tell you some but I am not sure how they would come across in writing. The tour takes you on foot around the heart of Reykjavík starting as we said in Austurvöllur and finishing at the Harpa Concert Hall. The main focus is the history of Iceland from the landing of the Vikings and how the country was populated (now that’s a funny story told by Eric.) We learn of Reykjavík as a town and its quirks such as the “Tree of the Year” competition, when you visit you will totally understand. Eric will also go into more detail about Vikings and their way of life as they are very important to Iceland. After all, they settled this country. Statues of prominent Vikings are found throughout Reykjavik. 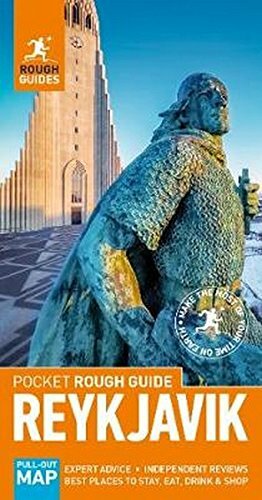 Eric will also tell you about the famous Elves of Iceland and how they are so much a part of the Icelandic way of life. They so well respected and often roads are diverted as to not destroy their homes. The stories of the Elves are great for the kids and even the adults. It makes you look for them everywhere you go as you wander the city. The Reykjavik walking tour is heavily comedic with stories, tales and yarns about Iceland and its people. The guides happily poke fun at themselves and their country in a light-hearted and still informative style. This is a must-do activity when in Reykjavik Iceland and something not to be missed. Trip Advisor ranks CityWalk Reykjavik this the number one activity in Reykjavik with over 2900 excellent reviews and it gets a huge thumbs up from us here at Wyld Family Travel! The Reykjavik walking tour is an easy walk with time to rest if you need it. Make sure you have some water with you though as you do get thirsty wandering the streets and there are times you are away from shops. It is an easy walk for the kids too and ours loved Eric and his stories. If you need to Eric will point you back in the direction you need to go in after the city sightseeing Reykjavik tour has ended. Like most City walk tours they are ‘free’ but you are encouraged to pay what you believe the tour was worth. We happily left a payment in Eric’s backpack for him as we think he was one of the best tour guides we have ever had! Follow along below with our picture journey of the amazing City Walk Reykjavik. The city buses in Reykjavík are yellow. The Icelandic word for them is strætó, which is short for strætisvagn ( streetcar ). These buses are the only public transport in the city. We opted for a Blue Lagoon and outside tours rather than a city tour when we had our day in Reykjavik. I regret not having seen that iconic church! I haven’t been to Reykjavik, but from your photos and this post it sounds like a free walking tour is a great way to see the city. I’ve done walking tours in other cities, and I love how I can learn a little bit and get some bearings to how things are set out. Also I love learning that bananas toppled a previous Icelandic government. Iceland sounds like a pretty quirky country; one I’d love to visit myself. What an interesting walking tour. I love a good walking tour, such a great way to get to know a new city. Eric sounds like a riot. Reykjavik is so beautiful. The architecture (the instrument like shaped) looks so grand and beautiful. Although the weather is gloomy, the beauty reveals itself!